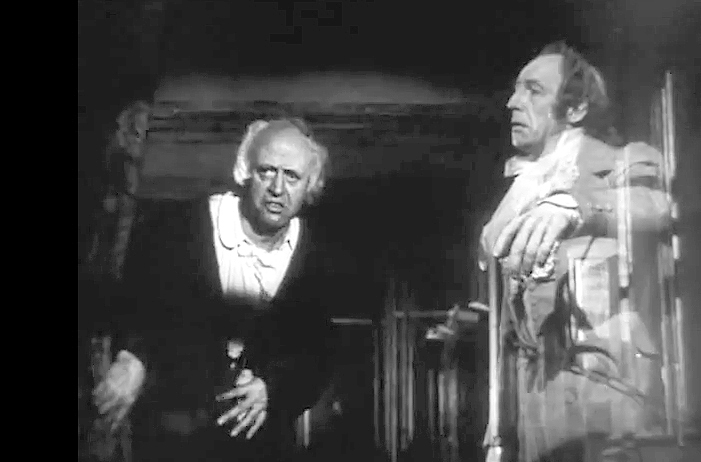 At this time of year, I think there is no better movie to review than one of my favourites, A Christmas Carol (originally entitled Scrooge), from 1951. As may be discerned, this is not going to be a negative review, but I will provide ample evidence, I believe, to show why I find such favour with this film. 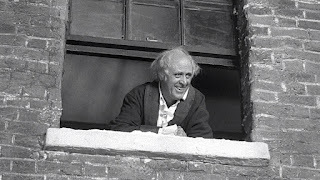 It follows the very familiar story of Ebenezer Scrooge, a man so miserly and miserable (the two words once had similar definitions) that he has no liking at all for his fellow man, merely contempt. 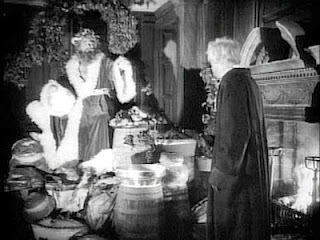 To turn his life onto the proper path once more, he is visited on Christmas Eve by four spirits, beginning with that of his late business partner. Through a series of flashbacks, which Scrooge and his guides - the various spirits - also observe, the viewer sees the gradual transformation of Scrooge from hopeful young man to angry misanthrope. 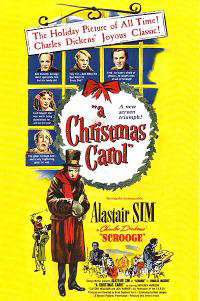 With such a well-loved classic as A Christmas Carol, there will certainly be no faulting the story in this movie. Like Jane Austen novels, like Alice in Wonderland, Dickens’s Yuletide tale has proven itself with more than a century of popularity. If any movie adaptation of it fails, then it surely is not the fault of the story. But this fact does not automatically guarantee a successful adaptation, either. There have been several films made from the book, and their quality has varied. 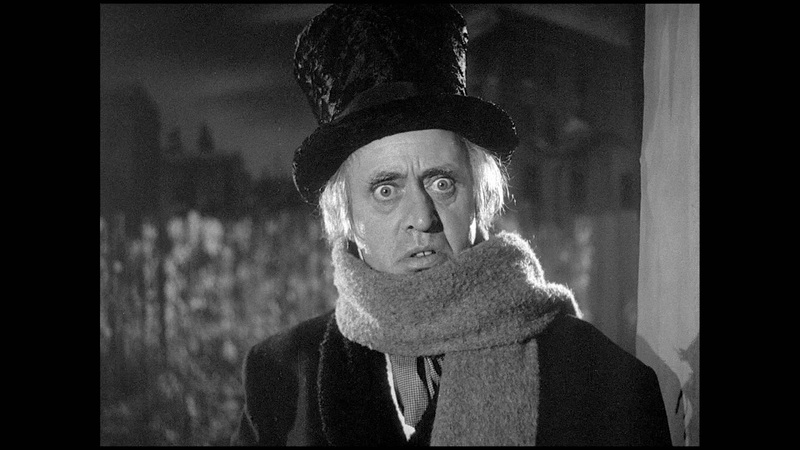 I think first and foremost, the 1951 version owes its supremacy to the lead actor, Alastair Sim. A career in performing begun in the 1930s gave him great experience as both a leading man and a character actor. 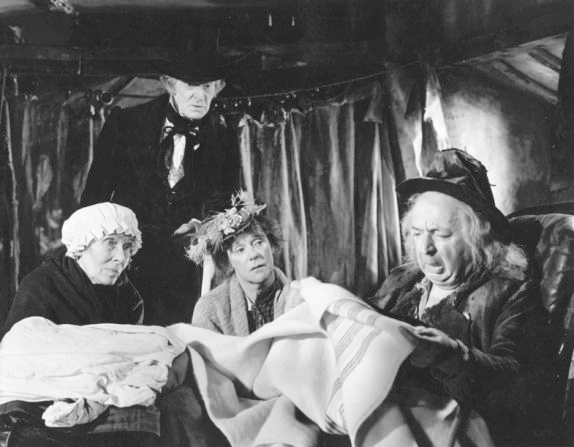 His portrayal of Scrooge walks a fine line between caricature and realism: he invites us to ridicule the old man for his disdainful ways - there is a large dollop of comedy, sometimes subtle - in this irritable old man, but he is nonetheless imbued with a humanity that we recognise. It was after the tenth or twelfth viewing of this film (yes, I’ve seen it that often) that I realised Scrooge, as depicted here, is paranoid. Witness the start with which he greets a knock on his office door, and the fright a debtor gives him on the front steps of the Exchange. One would think he was expecting to be ambushed. As well, the number of bolts on his door at home suggests a man with enemies. It is made clear that Scrooge has no earthly foes, but there is something in the back of his mind that worries him about his life - and with good reason, as it turns out. Sim’s Scrooge starts as a crabbed old man, hunched over, pulled into himself, keeping the world physically at bay. When he is redeemed, he comes alive again, and is a spry, lanky fellow, dancing polkas, standing on his head and moving with the agility of an adolescent. 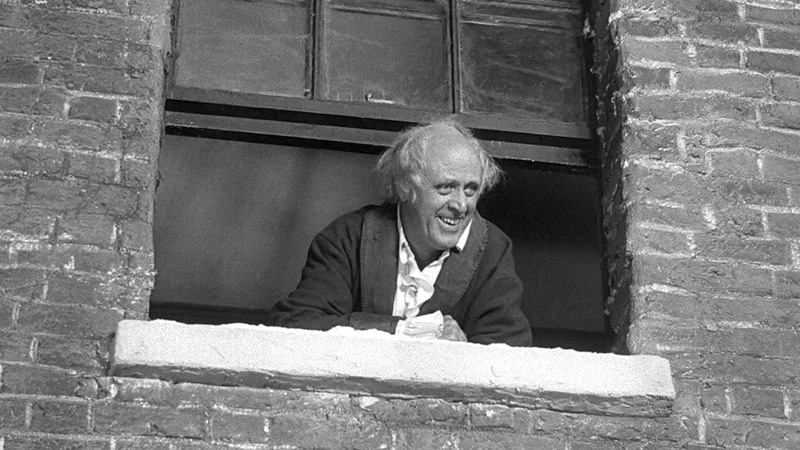 The giddiness with which he embraces life at the end is contagious, and I suspect that few viewers could refrain from grinning along with Scrooge at his newfound happiness. Other actors compliment Sim marvellously, from Kathleen Harrison’s charlady, with a voice like a door-hinge, to the delicacy of Carol Marsh as Scrooge’s sister. There doesn’t seem to be a mis-step in the casting. Jack Warner plays Mr Jorking, the symbol of the insidious seduction of wealth, and a character who was not, so far as I can recall, in the book. I rarely approve of screenwriters tampering with successful source material, but Warner’s performance and the lines he is given are perfect fits for the story. 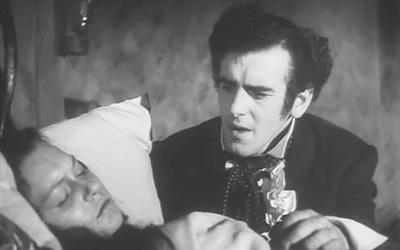 George Cole plays the young Scrooge. He would go on to a forty-year career in movies and tv, thanks to Sim. The elder actor and his wife practically adopted Cole and his wife; Sim and his protègé worked together in numerous films. Much of the praise must go, as well, to the director of the movie. 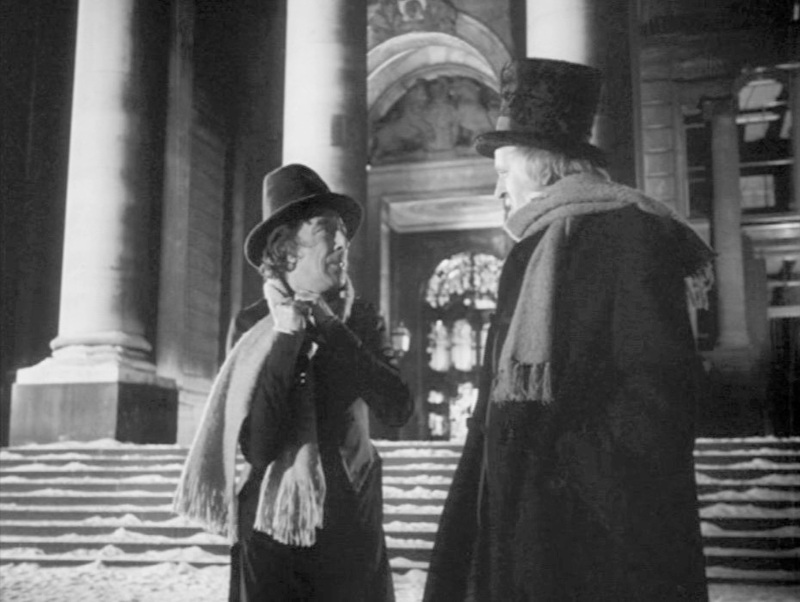 It’s an open question as to how much Scrooge’s cheery transformation owes to the director as opposed to the actor. The fact that it’s hard to tell is a compliment to both. The atmosphere contributes much to the film’s success. The eerieness of Christmas Eve, with tricks of light and dark, its cold, when everyone must be bundled up, is contrasted with the appeal of the following morning, when windows are open and the air is fresh. The joviality of the Spirit of Christmas Present (my favourite visitor) evokes the fun that the miser is missing, as much as the speechless doom of the Spirit of the Future shows what he will suffer. 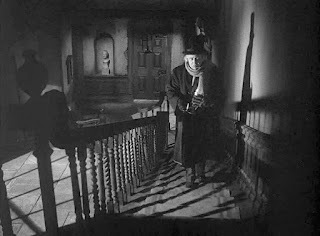 At 86 minutes, A Christmas Carol moves along at a fair clip; there is nothing extraneous to the plot, and the story doesn’t bog down at all. Lastly, a word must be written about the music. Richard Addinsell combines old carols and folk tunes (the lovely “Barbara Allen” is a recurring theme indicating a lost - and regained - happiness in Scrooge’s life) with new compositions. It is an instance of a movie’s music being noticeable and yet contributing to the story, and not overpowering it. This is not always the case with films. I watch A Christmas Carol each year, and frequently discover something new about it. A professional critic once wrote that it is too good a film to watch only at the Yuletide, but it has become a part of many movie-lovers’ holiday traditions, and it has long been one of mine.